I spent the afternoon in the Maboneng Precinct yesterday. I had a ridiculously good time. 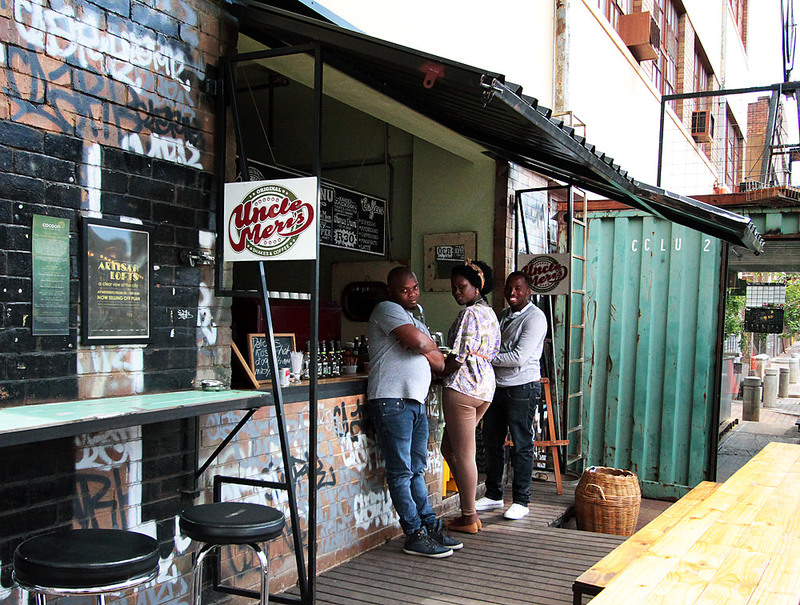 Uncle Mervs, a streetside coffee shop in Maboneng. 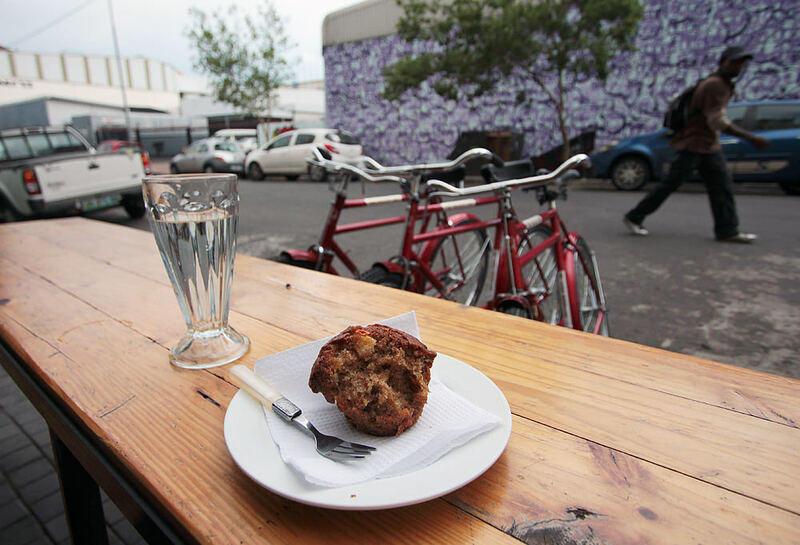 Watching the world go by while eating a carrot and apple muffin from Uncle Mervs. 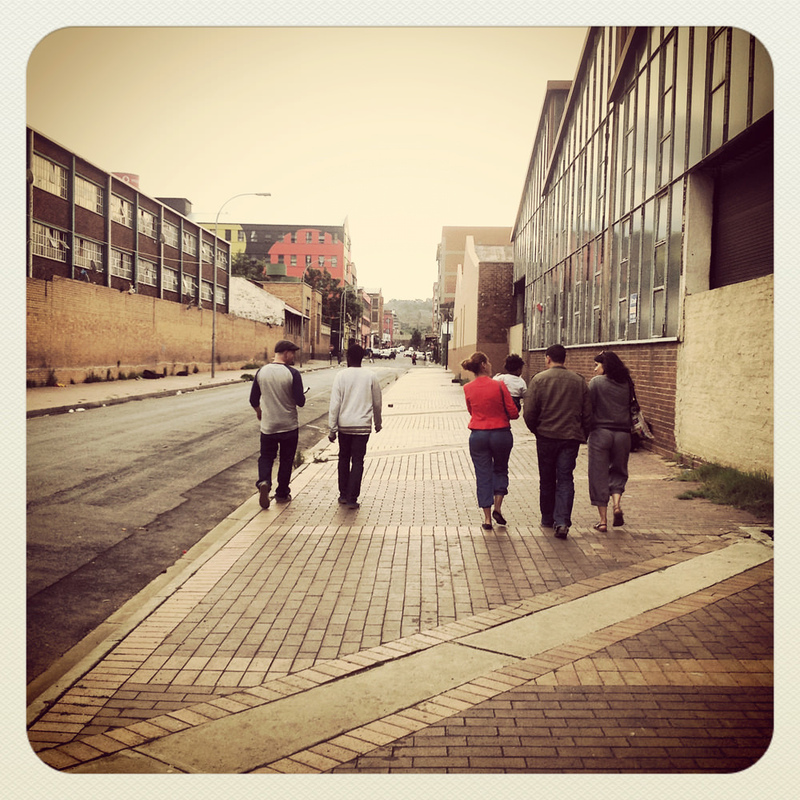 “Instawalking” through Maboneng and surrounds, checking out public artwork. I’ve been meaning to write a post about Jozi’s Maboneng Precinct for a long time, but I’ve continually put it off for a couple of reasons. First, I don’t know where to start. 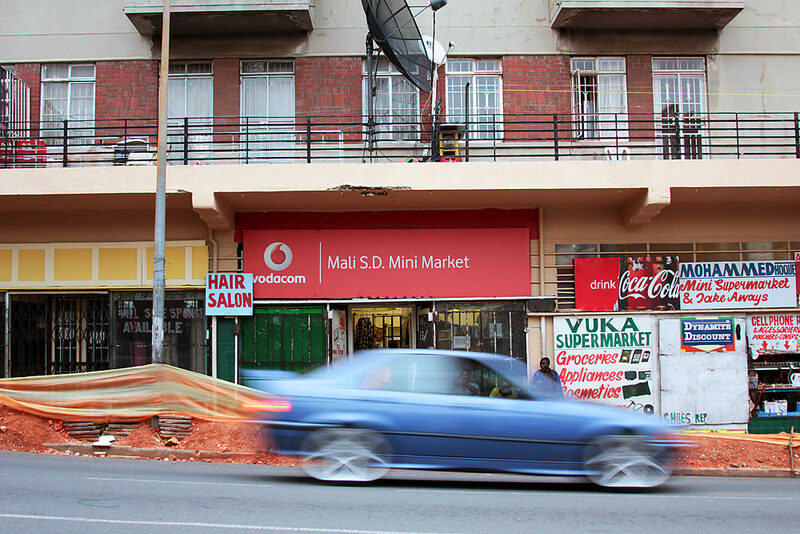 This corner of Joburg is transforming so fast that it’s difficult to even explain what it is. 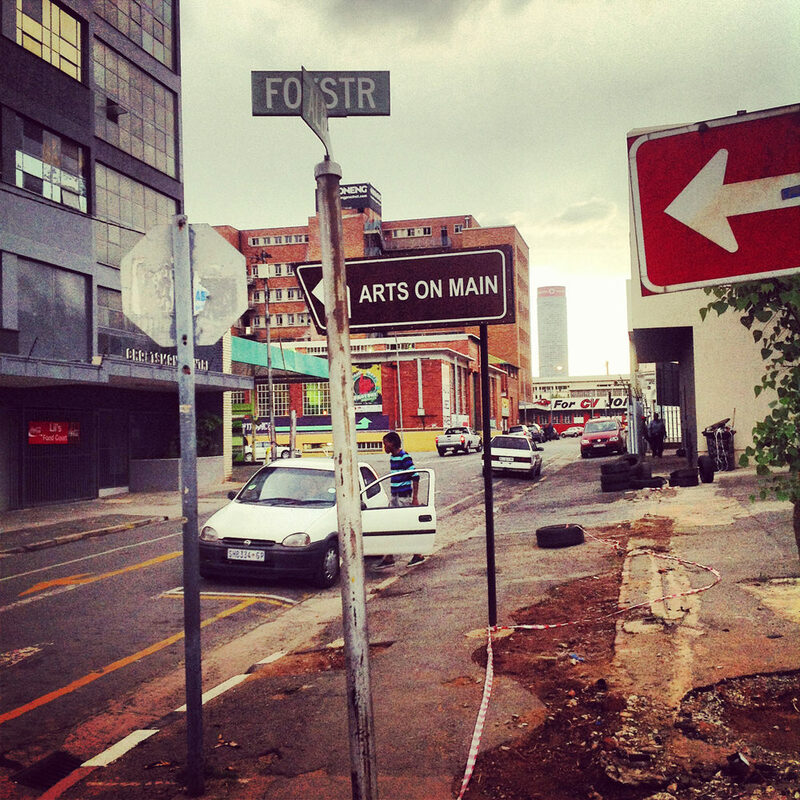 Everyone knows about Arts on Main, the mixed-use entertainment venue at Maboneng that opened three years ago. But there is so much more. Literally every week there is at least one new shop, restaurant, gallery, avant-garde performance venue, apartment building, flexible working space, and/or other innovative concept sprouting out of Maboneng. I get a weekly email from Maboneng and have a hard time reading the whole thing without my brain exploding. Second, I’ve been feeling a bit put off by Maboneng recently. Don’t get me wrong, I think urban renewal is great. I didn’t live here five years ago, but I understand that the area now called Maboneng was completely desolate and abandoned (at least economically) back then. Now Maboneng is a hip, thriving, exciting place to live and hang out. 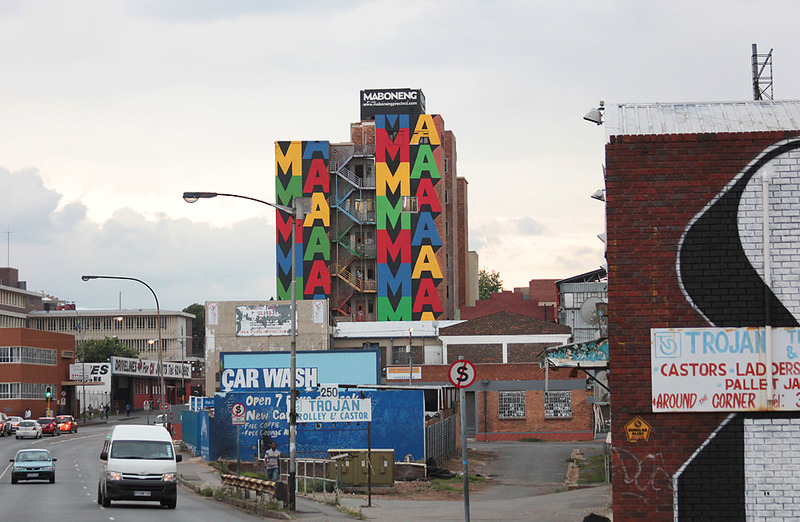 Maboneng is funded by one property development company, run by a man named Jonathan Liebmann. I’ve never met Jonathan, although he is obviously a visionary with immense passion for Joburg. But I feel disconcerted by the idea that all the breakneck-paced development in Maboneng — rolling along with unstoppable force — stems more or less from one person. But anyway, I don’t really know what I’m talking about. 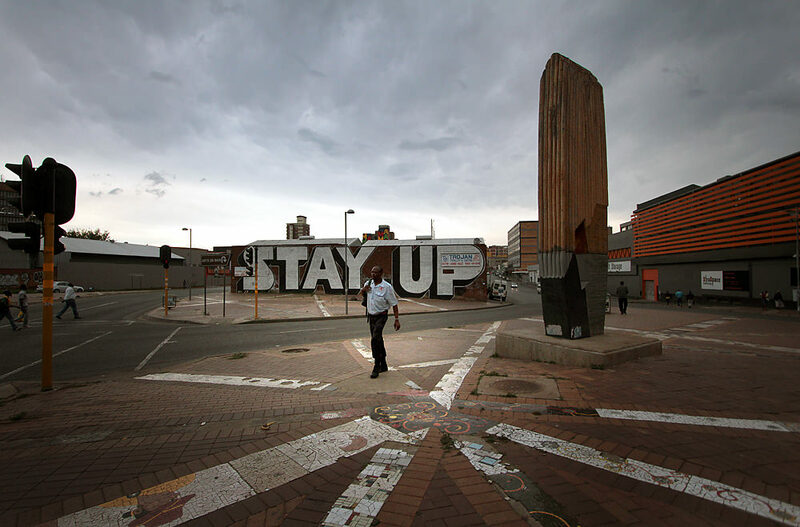 I don’t do urban socioeconomic discourse on this blog — I’ll leave that to my friends at Urban Joburg. All I really want to say is that despite my mixed feelings about Maboneng, I spent an afternoon there yesterday. I’m glad I did because it was awesome. 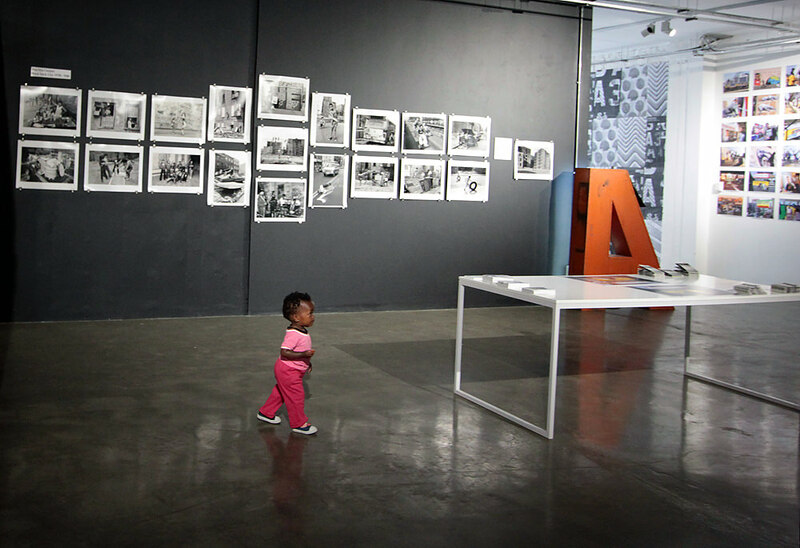 My main motivation for going was to see the I ART JOBURG exhibition at AREA3, a new creative space at Maboneng. I ART JOBURG is a public art project sponsored by Adidas. 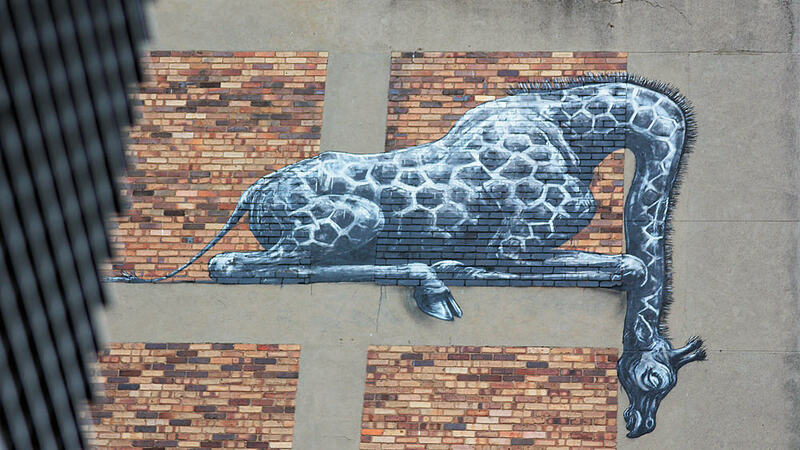 Five graffiti artists from around the world came to Jozi and painted ginormous murals on buildings around Maboneng. Renowned street photographer Martha Cooper came from New York City to document the murals. Martha’s photos are on display at AREA3, along with various works by the graffiti artists. Checking out Martha’s pictures at AREA3. I was particularly excited to see this exhibition because it has a connection to my home town. Martha Cooper is originally from Baltimore, and has spent many years taking photos in a rough (but very cool) Baltimore neighborhood called Sowebo (short for South West Baltimore). My family used to own a house in Sowebo and my aunt and uncle lived there for many years. 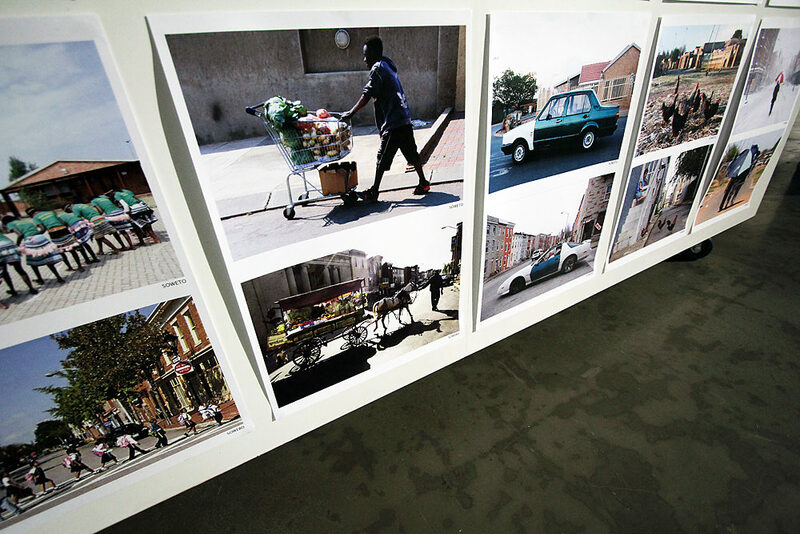 The I ART JOBURG exhibit includes a series of Martha’s photos comparing Sowebo to Soweto. 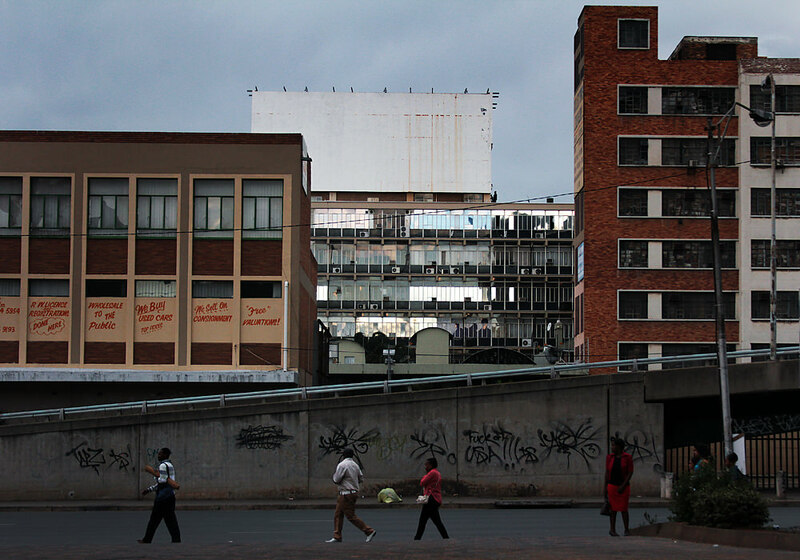 It made my day to see photos of Sowebo, a place that virtually no one outside Baltimore has ever heard of, in Jozi. 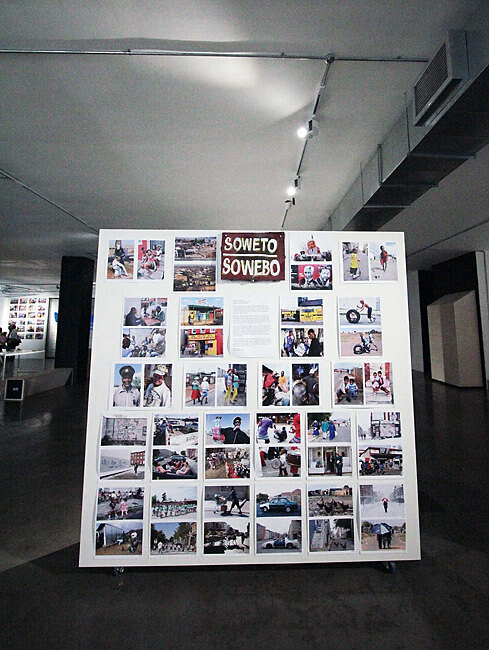 The photos are presented in pairs — one of Sowebo, one of Soweto — showing the uncanny similarities between the two places. I stood in front of this display, happily studying every picture, for about 20 minutes. I have often thought that Baltimore and Joburg are similar to each other. Both cities are tough, lovable, and beautiful in unconventional ways. Apparently I’m not alone. 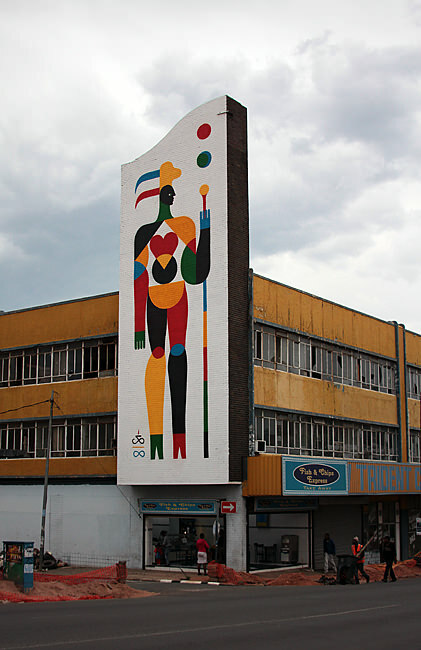 While chatting with Jabu, a staff member at AREA3, I learned that there would be a walking tour of the I ART JOBURG murals at 3:30. I killed some time by shopping and eating (not hard to do in Maboneng), then moseyed back to AREA3 at the appointed time. I met some of the other people going on the walk: Roy, Tim and Andile. I looked at Roy. “Are you Roy Wrench?” I asked. Roy Wrench is an Instagram legend. He shoots only with his iPhone — doesn’t even own a DSLR. His work is phenomenal. I was a little starstruck. “STAY UP”, also by ESPO. “Ouma Miemie” by Hannelie Coetzee. This work is not actually part of I ART JOBURG, but it’s in the same neighborhood. The Carlton Centre looms in the distance. Piece of the wildlife mural by ROA. See Martha Cooper’s pics of the full mural here. The murals are great and I loved the walk. (Thank to Bongani from Mainstreetwalks for the fantastic tour, and the poem.) I should mention, though, that there is some controversy swirling around I ART JOBURG. 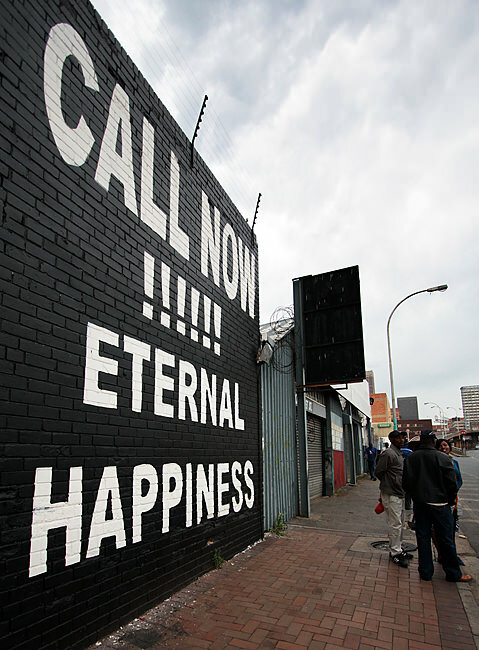 Members of the graffiti community here in Jozi have questioned why no Joburg-based artists were asked to participate. I also thought this a bit strange as I was looking at the exhibition. Regardless, the murals gave me an excuse to take photos in downtown Jozi. I’d forgotten how much I love doing that. Another random street scene — my favorite of the day. Random street scene, Instagrammed. Ponte Tower looms in the distance. 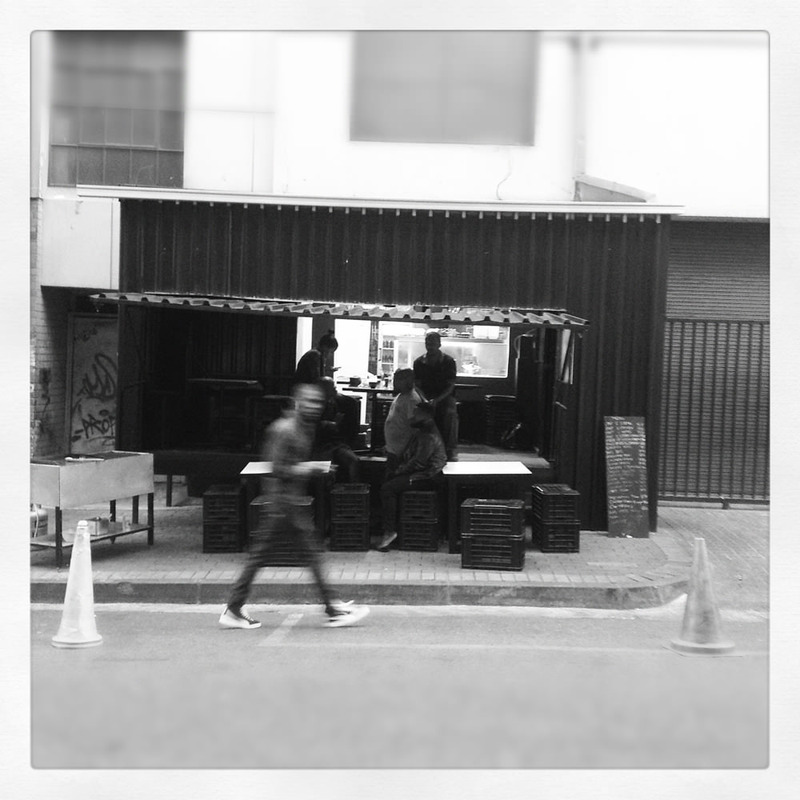 Sharp!, a streetside braai restaurant and local hangout on Kruger St. in Maboneng. I was sad when the walk was over. But my new Instagram friends invited me to have a drink with them, which was cool. We settled down inside Pata Pata just as the rains came, and talked about photography. 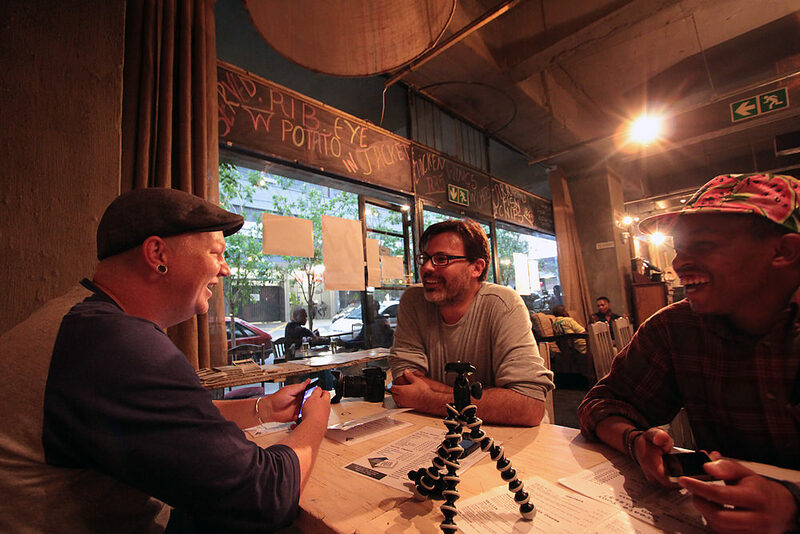 Roy Wrench (left), Tim (centre), and Andile (right) discuss iPhonography. I think they are laughing at my iPad. I got soaked walking to my car in the downpour. But I was happy. You’ve won me over, Maboneng. I heart you. 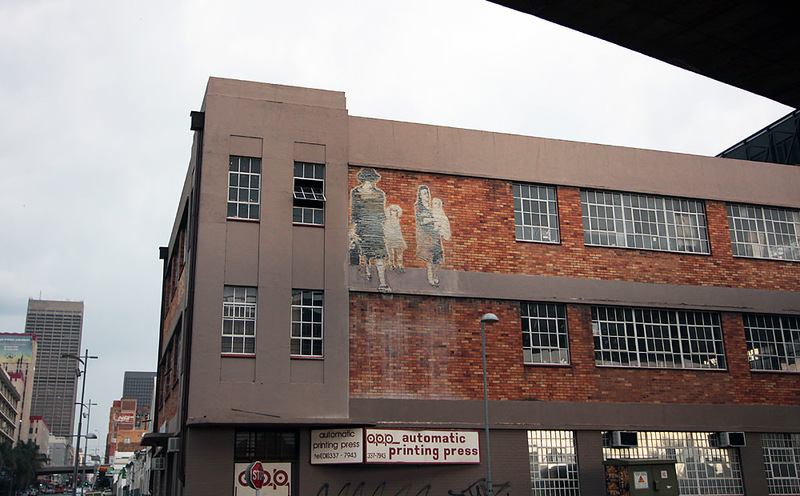 It took me ages to blog about Maboneng for a very similar reason. It really is a fantastic places but there is something which gives me these weird mixed feelings about the development. That being said, I still really enjoy visiting the area regularly. Love the shots you got – Jozi is beautiful. I’m glad I wasn’t alone in feeling that way. I think I understand your reservations Heather. Time will tell. Absolutely LOVED Roy’s exhibition! One in particular with sun flare, shows just how it CAN be done! Your Ponte Tower one is great too! photographer friend of my dad! Central Joburg seems to be on the move. The graffiti is really cool, nice shots. ROA also has a famous mural right around the corner where I live in Berlin, check it out: http://www.flickr.com/photos/mortalcoil/6887008321. Cool. He has a very distinct style. I loved the Sowebo/Soweto part best – how amazing that there even IS a Sowebo and that there is a photographer out there who compared the two with such great shots. I know. So cool. Sowebo is a fascinating neighborhood — very quirky. This is really interesting for me. I graduated high school with Marty Cooper (Forest Park HS). She did all of the photos for our yearbook in 1959. We even went to junior high together I think. She lived in Mt. Washington. I loved your photos also! Ellen, that’s so cool! Dad knows Martha too, which I meant to mention in my post but forgot. They met a few years ago when Martha was taking pics in Sowebo — they both owned houses there at the time. Small world. Gosh, thanks for reminding me of this post. Glad I didn’t miss it! Sounds like a place I’d like to visit–and even live. And, damn Heather, I’m crazy about that next to last photo. Hope you’re having a great day! Thanks Kathy. Do you mean you’d like to live in Sowebo or Maboneng? Thanks for giving me another “feeling” photo walk of South Africa. I begin to feel like I “been there”, just a little. The other day my son took me on an all-day bus tour of Boston. I took a thousand pics of just the city, and have still to weed through them, but I can already see that there needs to be something in the blood. Your pics with an iPad are art, while mine with a DSLR are tourist snapshots! Oh well. Heather, always surprised by how much you discover of Jozi. I am following you! Hope to check out the exhibit soon.